To celebrate, we’re giving away a bottle of our skin-brightening Vitamin C Serum! Simply comment on our blog (below) to enter to win. This contest is open to residents of the U.S. and Canada and will end on July 7, 2014 when we announce the winner on our Facebook page! The winner will also be contacted privately via email. BEFORE YOU COMMENT, check out these blog highlights! QUIZ: What’s your beauty style? Are you missing out on this natural ingredient for beautiful skin? Your top 5 skin care questions answered here. This is my favorite MB product! If I use only one thing at night before bed this is it! Mario Badescu is a Genius and so are his amazing products. I love MB’s Vitamin C Serum and use it daily. I am just about ready for a new bottle; so this would be a great win! Love your products! I got free samples a few weeks ago and haven’t looked back since when I bought the full-size items. My skin has never looked and felt better! Thank you! Love this stuff. Happy 4th of July! I absolutely love Mario Badescu products. I was recommended ones from the representative on the phone for my daughter and I. Now we both use Mario Badescu. After reading all the comments here, I would really love to try this serum. Sounds like it works great for every one. Also, Happy Independence Day on this 4th of July. Mario Badescu products are a wonder, so amazing, great results. Would love to try this, heard amazing reviews ! Free yourself from dull and aging skin. Use MB Vitamin C Serum in your skincare routine to redeem your dull and aging skin. I love all my MB products, but have yet to try this one. I would really, really love to try it. Have never tried it but would love to! Hey! I really hope I win this wonderful prize! Love your products! Especially the Drying Lotion and the Glycolic Foaming cleanser. I’ve been wanting to try the Vitamin C Serum so very badly. Would love to win this gem! 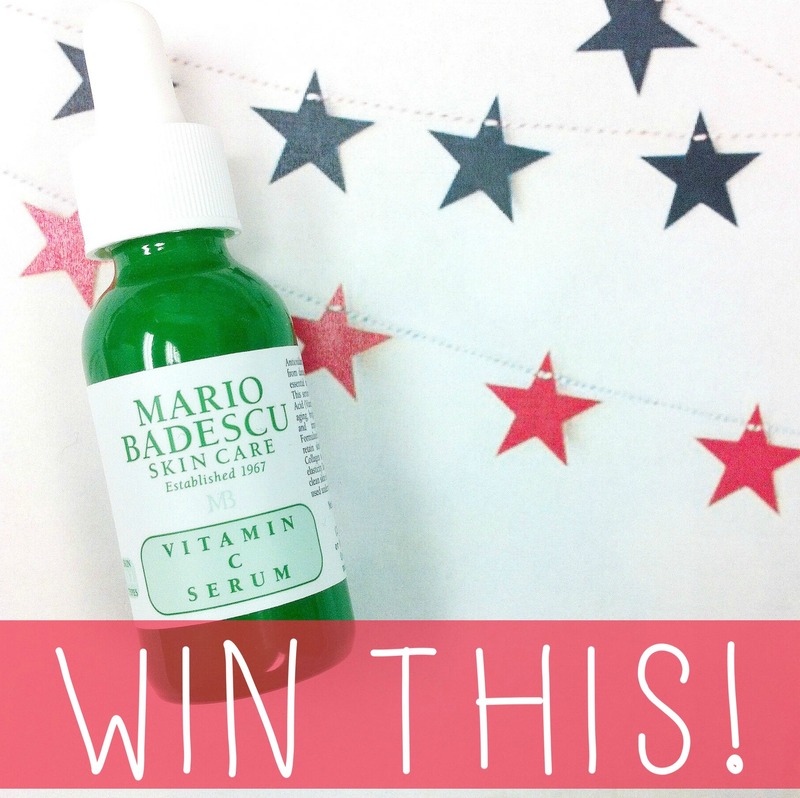 I have used Mario Badescu products for years – would love to try the Vitamin C serum! Thanks! Thhis stuff is amazing! I’m so happy I bought it and tried it, and never went back! I love this product its amazing . Definitely my go – to brand and product. Happy 4th of July everyone!!! Hope its a good one, mine won’t be good without the care of Mario Badescu’s products!! I just bought some last night, can’t wait for them to come into the mail!! I want to try this serum. would love to try a product with the great reviews. Have to try this serum. Hear it’s amazing. I’m a recent convert to Mario Badescu. I have loved everything I’ve tried. Would love to give this serum a shot, too! Awesome, I’d love to try this! Would love to try your Vitamin C to get a brighter complexion. I’m currently using Cellufirm drops, but I have heard great things about this serum! Vitamin C sounds good to me and for my skin! Thank you for the chance! I need to add this product to my daily routine. Happy 4th! Thank you for the chance! Love all your products. Have never tried this! This stuff is awesome…would love a free bottle! I have never used Vitamin C serum but I would love to try it. This one one product I have been wanting to try! Happy 4th everyone! Have heard a lot about this product. Would love to give it a try. I love the strawberry tonic and cucumber masks!!! Would love to try this serum! Thanks MB! Sounds like everyone loves this product! Would love to add it to my regimen of Mario products. Thank you for opening the giveaway to Canadians,as well! 🙂 Would love to try this. I would love to try this serum. Thank you for an awesome giveaway. Love your products and am excited about the contest! I love every product I’ve ever tried! This one shouldn’t be any different!! I would love to try the vitamin C serum from Mario Badescu, I have tried a few of the other skin care products and I love them!!! I use all MB products– they are the best! I love would love to add this product to my regemine! I’ve never tried this, would love to win! Vitamin C Serum would be great to help me improve the look of my skin! My sister loves MB and she just recently introduced me to the line which I am so excited to try since I recently started chemo and now only look for any product that is natural all healthy for the body! I have never tried these products but see a lot of excellent reviews about them and would love to try out! I was able to test this product out on my skin at Ulta and fell in love with it! I would love to try this Vitamin C serum! Would LOVE a little help in the skin-brightening department! This would be a great addition to my skin-care routine! Love the Mario products!! My skin is so much better since using them!! #mariobadescu Thank you for being loyal to my skin! By using your products enzyme gel cleanser to drying mask for my acne, i’ve noticed less big bulks of acne. It’s becoming clearer! Thank you!! You demonstrated loyalty through products and prices! Love this skincare company!!! Would love to win an try this! I am so anxious to try this product! Everything Mario Badescu produces is pure magic! Ooo!! I’d love to try this serum! MB products have changed my life. Literally every thing I’ve bought has been a hit. Looking to give this a try next! I would love to win this! I’m currently suffering from uneven blotchy skin due to my pregnancy. I don’t have that beautiful glow and I know this would help! I’ve been in love with the Drying Lotion and Rose Water Spray so I know I would just adore this too. Love, Love, Love your products. Mario Badescu products are life. Thank you for the chance!! I am so in love with Mario Badescu products!! I use the Glycolic Cleaner and Toner, Botanical Facial Gel, Facial Spray (SO refreshing! ), Whitnening Mask, Flower & Tonic Mask and Drying Lotion. Your products are the absolute best on the market! Would love to win this Serum! I love vitamin c products and would be thrilled to try this one!!! I love this product and would be so happy to win it! I’m so excited there is a giveaway for this serum!! I have been DYING to try this out but it’s a little pricey, and not in the budget right now! Hoping for a win!! I’ve been wanting to try this for the longest time to help fade my acne scars but it’s a bit out of my price range 🙁 please let me be the lucky winner!! I love all Mario Badescu products, would love to try this serum!! Best products ever!!! Would love to win this! Always wanted to try it! My saving grace is the drying lotion! Thanks MB! Mario Badescu, if it’s cool with you, I would really like to be the winner of this contest. Thanks! Used Flower and Tonic mask today for the first time and I’m in love! I been using the peptide serum and absolutely love it. Would love to try the vitamin c serum, I’ve heard so many good things about it. I haven’t tried many serums, but I love the Mario Badescu products I’ve tried so far! I’m sure this is just as wonderful! I love the acne products. actually I’ve haven’t used any products that were bad. I’ve been building up my MB collection but haven’t tried this yet! I would love to! I work for a retail store that sells Mario Badescu, and had the privilege of attending a training pertaining to your products. The trainer raved and raved about this serum and I’d love an opportunity to try it! I’m a huge MB fan and have heard so many great things about this product… I would love to win and have the opportunity to try it out for myself! Loving my MB regiment, but have never tried the serum. Would love to win! Mario Badescu ‘ s products are wonderful! I love Vitamin C Serum as part of my skincare regimen and with it being Mario ‘ s Vitamin C, well….that just makes it all that much sweeter!! Mario Badescu ‘ s Vitamin C is my fav skincare product! It goes without saying that all MB ‘ s products are the best but the Vitamin C is like giving my skin a refreshing boost of AAAAHHHHH!! I’ve never tried a vitamin C serum. But I love everything from MB, so I would love to give it a go. One benefit that I heard about vitamin C serum is that it can lighten acne scars. Definitely a perfect match with the drying lotion which I use ALL THE TIME. It’s a product I cannot live without. This product has great reviews. Would live to win a bottle!! I think it is so interesting that vitamin C is so effective as a topical ingredient—would love to try it. Love your products. Love your drying cream and glycolic wash. Huge fan! !